ongregational membership in the United States is slowly declining. Data from the General Social Survey show that 17 percent of Americans attended a religious gathering weekly in the 1990s. By 2010, this number had dropped to 11 percent. These changes spark new questions about how people’s personal religious and spiritual beliefs are changing. They also raise questions about where, if at all, people experience the sacred. With architectural historian Alice Friedman and photographer Randall Armor, I located and documented more than 50 hidden sacred spaces in the greater Boston area alone. Tucked around the edges in Boston – in hospital chapels, meditation rooms in universities, and prayer rooms in airports, nursing homes and a range of other institutions – these spaces are open to the public. While conducting research for a book about religion and spirituality in health care, I visited many hospital chapels, meditation and prayer rooms. I began a conversation with Alice and architect Karla Johnson, who built an interfaith space at Tufts, several years ago. We hoped to photograph and share these spaces with a broader audience as a next step in our conversation. Karla became ill and died in 2016, and Alice and I decided to continue these efforts in her memory. As a first step, photographer Randy Armor and I started driving around the city last summer photographing as many chapels, meditation and prayer rooms as we could find in institutions focused on things other than religion and spirituality. In the past nine months we have located close to 80 such spaces and photographed just over 50. Even as congregations decline, we learned, chapels, meditation and prayer rooms remain, and people are eager to talk with us about them. We found these spaces in hospitals, nursing homes, colleges and universities, the port, the airport, public parks, malls, state prisons, cemeteries and even a local museum. Some are standalone, while others are a part of larger buildings. Some were designed by well-known architects, while others were created informally by people desiring a small retreat. Chapel at New England Seafarers Mission. The chapel at MIT, for example, was designed in 1955 by prominent architect Eero Saarinen and paired with his famous Kresge Auditorium nearby, intended to meet the religious and spiritual needs of everyone on the MIT campus. A small prayer space at the New England Seafarers Mission in the port, in contrast, has been moved and changed several times. Today it consists of a cushion for someone in a kneeling position, behind a movable screen under a tapestry of the Last Supper. 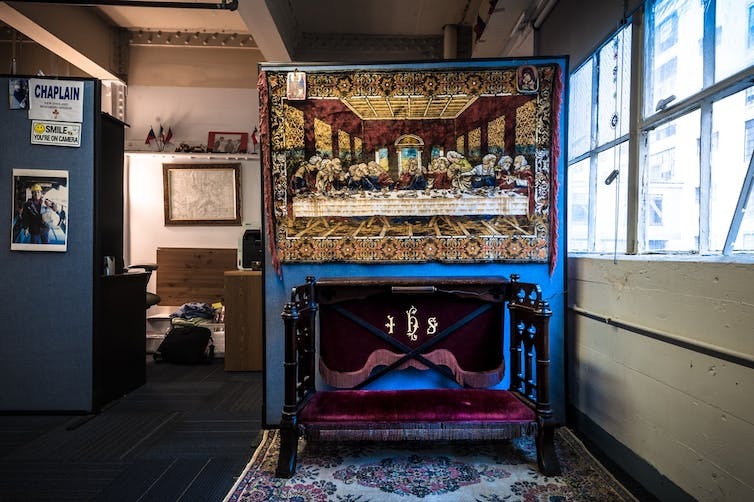 While some of the spaces we found look much as they did when constructed, others have evolved over time to accommodate people from a range of religious traditions. At Brandeis University, for example, the original chapels were built in the early 1950s for Protestants, Catholics and Jews. Today there are spaces for Muslim, Hindu, Buddhist and other students in various areas across campus. 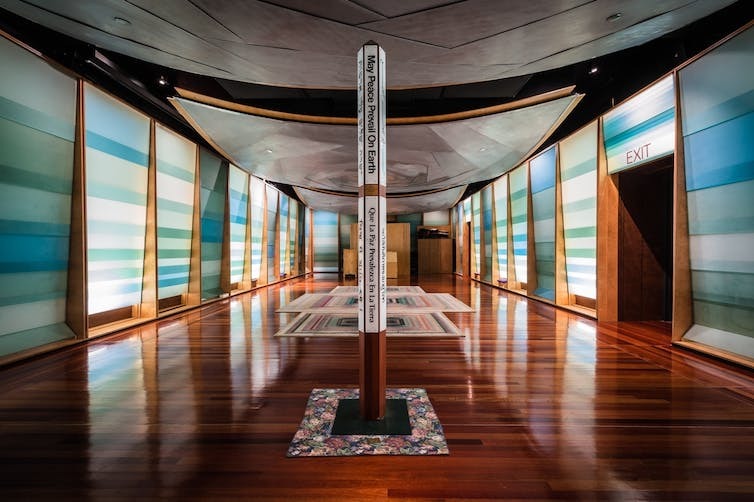 At Northeastern University, a sacred space, a reflection room and an area for ablution, private prayer and meditation were literally built on the ashes of the university’s tradition Bacon Memorial Chapel, which burned in the 1990s. Designed by architects Monica Ponce de Leon and Nader Tehrani and opened in 1998, the area was designed to be flexible and accessible to multiple religious practitioners. Many of the spaces we located are utilized by diverse people and groups. Designers and users make a range of decisions to try to accommodate everyone. 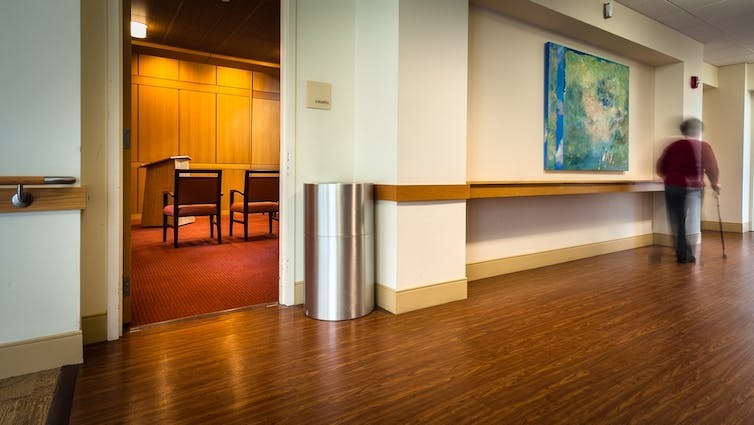 Flexibility is evident in many health care organizations where religious symbols have increasingly been removed from traditional chapels and furniture put on wheels to be as versatile as possible. At Massachusetts General Hospital, the original chapel, which opened in April 25, 1941, was created through the work of Rev. William Lawrence, retired bishop of the Episcopal Diocese of Massachusetts. In the late 1930s, he sent more than 1,500 letters to friends of the hospital asking for support to build it. A cross in the early chapel was removed and symbols and objects added for practice in a broader range of religious traditions. A Muslim prayer room was opened around the corner from the chapel in 1999 and a mihrab, or special niche that indicates the direction of Mecca, was added in 2005. Verses from the Koran in English and Arabic hang in the Muslim prayer room, which is used by visitors throughout the day. Friday prayers are held in a larger conference room nearby. Chapel at Massachusetts Correctional Institution, Concord. Prison chapels in greater Boston have also expanded to include spaces for people from multiple religious traditions. 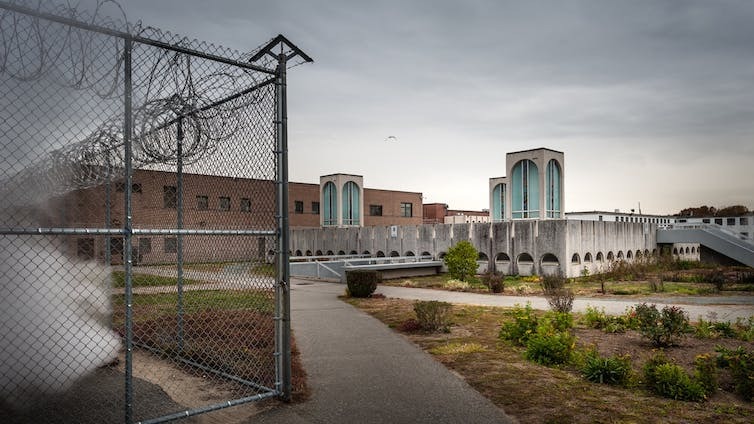 Constructed in the 1970s, a sunken building housing the chapels sits at the center of Massachusetts Correctional Institution in Concord. A Catholic chapel, Protestant chapel and Muslim prayer room inside are staffed by full and part-time chaplains from Catholic, Protestant, Muslim and Jewish backgrounds. While formal religious services continue to take place in a few of these settings – especially prison chapels – the majority are mostly often used as places of quiet respite. As we traveled around the city, we saw nurses stop into hospital chapels as their shifts change and family members use them as quiet places to cry. Chapel at Logan International Airport, Boston. We saw travelers at Logan Airport sit in darkened pews, with eyes closed and a small suitcase nearby, before they hurried off to find their gates. And we saw many people come through the chapel in the Prudential Center Mall in the midst of their working days. Some of these spaces are multi-faith, while others are Catholic. Some are mostly empty, while others – especially those in prisons – seem to often be full. Some, like Cushing Memorial Chapel in Framingham, tell stories about institutions shifting from care for veterans to the elderly to everyone – the chapel is now in a park, the rest of the institution having been demolished. As a group, all of these spaces suggest that what makes spaces sacred in Boston and nationally is shifting from religious symbols alone to broader symbols of nature, light and air. 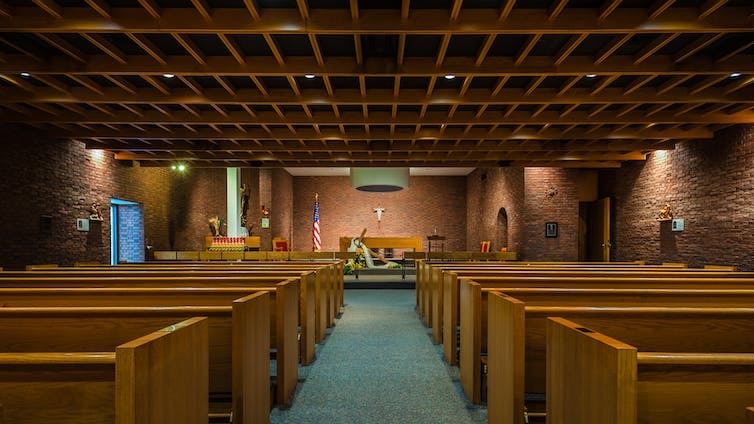 Such spaces are used quietly by many people across the United States even as congregations decline. We encourage people to notice them and the pause they encourage, often hidden from plain sight.